Founded in 1956, following the Government’s Life Insurance of India Act, Life Insurance Corporation of India is the largest insurance company in the country. Headquartered in Mumbai, Life Insurance Corporation of India is a state-owned insurance group and currently has an asset value of $240 billion. For those who are interested in availing a life insurance policy from LIC to secure the future of their family following untimely death (of the policyholder and breadwinner), they can facilitate the use of the premium calculator to determine how much they would have to put aside to avail a Life Insurance policy. To determine the premium of the policy that they wish to avail, all that the customer needs to do is to enter the plan name, their age, the tenure of the policy and the sum assured they wish to have with the policy. To ensure that there are no hidden costs, the premium calculator also displays the current applicable service tax (GST) that would be inclusive in the policy premium. For customers interested in availing a Life Insurance policy from Life Insurance Corporation of India, even before getting in touch with an insurance agent, they can calculate the premium to sort of assess how much they will need to spend, as well as determine their coverage at the end of the tenure. If the customer has his/her mind set on the final return at the end of the policy tenure, then they can adjust the policy premium to achieve their goal. To ensure customers know exactly how much they would need to pay for the plan premium, the premium calculator includes the applicable service tax (GST) as well - making sure that customers can make their calculations to the last digit. Why should one purchase a Life Insurance Corporation of India policy? 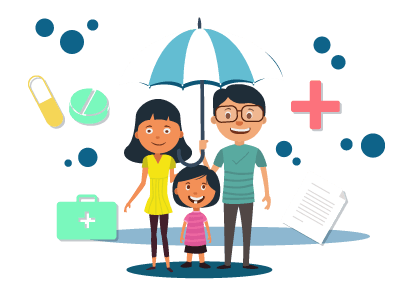 Availing a life insurance policy from Life Insurance Corporation of India offers financial security to the dependents or nominees of the policyholder following an eventuality or untimely death. In the case of untimely death of the policyholder, the nominees or dependents will receive monetary benefits to secure their future for the coming years. Customers can also avail a life insurance policy from Life Insurance Corporation of India for the purpose of building a pension corpus. The annuity at the end of the tenure of the policy will either be paid as lump sum or in regular monthly installments. In addition, policyholders can avail tax benefits for the premiums paid for each financial year. The premium of a Life Insurance Corporation of India policy depends on a number of factors, ranging from the age of the individual, the type of plan that he/she has chosen, the sum assured that one wants at the end of the tenure, whether the applicant is a smoker or a non-smoker, gender, and the applicable service tax (GST). The premiums vary between insurance policies, and if the applicant is younger, the lesser the premium that will have to be paid. For example, if one applicant is 18 years old and the other 42 years old, it’s obvious to assume that the 42-year-old applicant will have to pay a higher premium. Also, if the applicant is a smoker, he/she will have to pay higher premiums as the risk of health issues and death is higher. Some policies offer premium discounts for female policyholders or applicants, but that is subject to the terms and conditions of the policy. Visit the Life Insurance Corporation of India website. On the main page, click on ‘premium calculator’. First name, middle name (optional), and last name. Date of birth and completed age. Mobile number and email address (both mandatory). Once you have entered the details, click on ‘next’. Now, from the drop-down list, choose the plan you wish to purchase. Enter the tenure and the sum assured. Choose an optional rider[s] if you wish to enhance your protection. Select the premium frequency - single premium (lump sum), or annually, half-yearly, quarterly or monthly. Once this is done, the page will display the premium to be paid based on the premium mode you have chosen and the service tax (GST) to be paid along with the premium. The premium calculator will also display the sum assured at the end of the term as well. Note, premiums vary between plans offered by Life Insurance Corporation of India. Ensure you choose the right plan you wish to avail from the drop-down list. On the Life Insurance Corporation of India website (For existing policyholders and those already registered with the company). They can pay using their netbanking account, debit card, or credit card. 1. I’m not able to pay the premium for a first-time user on the LIC website? Is there a problem? Only those with existing LIC policies can pay their premiums on the Life Insurance Corporation of India website. You have to be registered on the website to make the payment or you can use the ‘pay direct’ option - but that’s only if you’re already registered. 2. Do I have to visit a Life Insurance Corporation of India office if I’m availing a policy for the first time? No, you can purchase a policy on the other payment premium channels as listed above. It’s not necessary for you to visit the office and you can make the premium payment online using your credit card, debit card, or net banking account. 3. Do I have to pay the premium through the single pay or lump sum mode the first time? Not necessary, you can choose the annual, half-yearly, quarterly and monthly modes as well to pay your premiums. 4. How accurate is the Life Insurance Corporation of India premium calculator? Provided that you have chosen the policy and entered all the required details correctly, the premium calculator is quite accurate. It will also show you the applicable GST (Goods and services tax), so there is no hidden cost at all. 5. Will the nominees or dependents receive all the benefits of the LIC policy as well? Yes, in case of the untimely death of the policyholder, the nominees or dependents will receive the benefits of the policy.